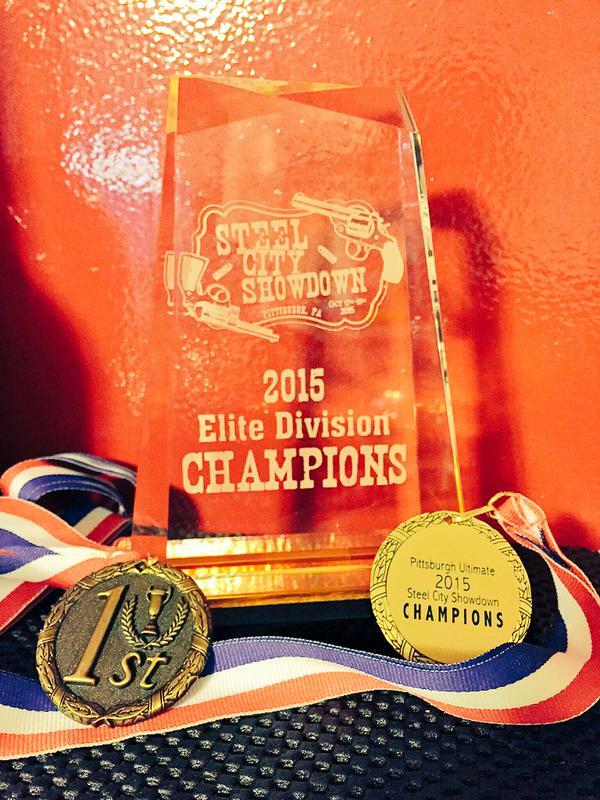 First tournament victory for Pitt 2016 – Steel City Champions champions. Alumni Game 2016, behind the Cost Center where the team was first founded. This is the kind of matchup the people wanted to see. A system-based Nationals blueblood and a gunslingin’ short bench of warriors. 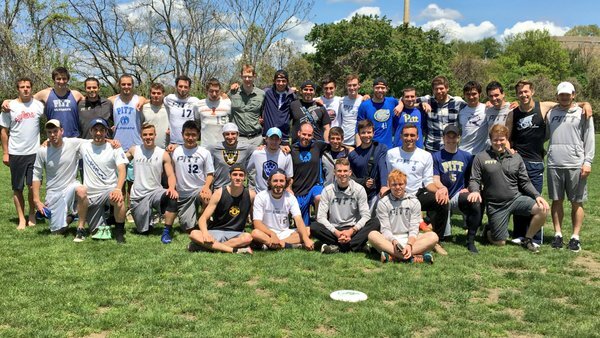 Pittsburgh led the whole way and the game would never be in real doubt but there’s a reason why Dozen is the most watchable team in college ultimate. The burning question for any A&M opponent is: how are they going to try to minimize the damage of Callahan finalist Dalton Smith? Pittsburgh was no stranger to how lethal Smith could be with the disc and prepared accordingly. It took all the king’s men, but it was a strategy that worked well and played to Pitt’s depth. A&M had already given tons of points to their top players like Smith and country-strong cutters Ben Lewis and Carter Hollo to advance in the elimination bracket. There was a rotating cast of defenders assigned to Smith. Carl Morgenstern and rookie Mike Ing primarily took turns guarding A&M’s ace, with Trent Dillon coming over from offense sporadically to take a shift. Since Dalton Smith played 23 of 24 points, he was constantly marked by fresh legs, then had the tall order of covering Dillon on defense. Before long, Pitt broke to go up 3-1 and had other chances to build a bigger cushion but A&M showed some true grit. The following Dozen offensive try was perhaps the most dramatic hold of the tournament ” a five turnover point that included an unsuccessful attempted huck from the back of the endzone while Pitt waited for Smith to walk it up, and a baited layout block by Smith who hurriedly picked up the disc and ripped a hammer to Connor Ughetta. That would be Smith’s only hammer of the game as Pitt wisely chose to force backhand the whole game to limit overhead chances. Just as they did in the final round of pool play against Carleton, Pittsburgh’s O line hummed along at high efficiency. Pat Earles caught a goal and threw his third of the game to take it to half 8-4. Dozen would get their only break of the game shortly after halftime to narrow Pitt’s lead to 8-6 but Pittsburgh would prove too much as they continued play deep into their bench. One of Pitt’s lesser known role players, graduating senior Kevin Tang, chalked up two goals, a layout block, and an assist, reminding people that it isn’t just his team’s household names that will be missed next season. Coaches Jose Cespedes and Bobby Lewis made some solid adjustments in the second half. They were having trouble resetting in a no-dump vertical stack so they brought another handler back, which aided offensive flow. When Dalton Smith ran into some short field turnovers late in the game, they threw him in the stack as a cuter where he immediately caught a deep shot. Give Texas A&M credit. They went down swinging. Lewis isn’t lying. You could see the wheels turning in the heads of some young Dozen defenders but you also saw raw athletic potential. This program is still very much growing and even had a C team for the first time ever this year. It will be interesting to see what the landscape of this team looks like post-Dalton Smith. So Pittsburgh advances… and plays the one team that has presented the most problems for them this season in Wisconsin. Their losses to the Hodags, at Stanford and Warm Up, have been by small margins but have been in meaningful games. Pittsburgh’s offense is firing on all cylinders right now and Wisconsin’s defense is as stingy as ever. It’s a shame this isn’t the finals, but it would be robbery if we didn’t get to see this matchup at all. With UMass, Oregon, and Wilmington all eliminated, Wisconsin and Pittsburgh were two of the three top seeds still alive in Raleigh heading into Sunday play, and their showdown in the quarterfinals meant that only one of these renowned programs could survive to the semifinals. In the end, it was Pitt left standing after edging the Hodags 14-12. After two days of punishing heat, the weather in Raleigh offered teams a new challenge this morning in the form of torrential rain. Pittsburgh got out to a hot start, as the rain limited Wisconsin’s deep game. All weekend long, the Hodags had managed to score in only a few throws, usually off of flick bombs from Craig Cox. When on the first few possessions Cox got the disc in power position and didn’t let it fly, it was a clear indication that the rain had thrown a wrench into Wisconsin’s game plan. With Wisconsin dissuaded from launching their typical hucks, they were forced to work the disc underneath. Pitt responded by forcing Wisconsin’s cutters out, and slagging off of the sideline cutters of Wisconsin’s horizontal stack to take away angles in the middle of the field, making it very tough for the Hodag cutters to operate. Without the middle of the field open and with the rain making it hard to hit pinpoint over-the-top throws to the sideline, the emphasis was on Wisconsin to complete multiple horizontal throws to move the disc and open up angles of attack. In the heavy rain, this presented its own difficulties, and on the third point of the game Wisconsin’s Ross Barker let a wet disc slip through his mitts and Pittsburgh capitalized via a Sam Vandusen flick huck that gave Pitt the first break of the game and a 2-1 lead. Pittsburgh would get two more breaks in the first half, generating turns by sitting on Wisconsin’s backhands and forcing them to make tough forehand throws in the deluge. While Wisconsin’s defense had been able to create a few turnovers, their D-Line offense was paltry and often couldn’t move the disc more than 15 -20 yards before giving it back to Pittsburgh. Pittsburgh’s D-Line, much maligned in recent years for not being able to convert, looked much better, grinding short upline cuts for hard-earned but valuable yards and taking their opportunities with aplomb near the endzone. As the game approached the end of the first half the rain began to slow, and with the sun peeking out from behind the cloud cover, Wisconsin’s defense came to life, demonstrating apparent photosynthetic qualities. When Max Thorne overthrew Pat Earles in the back of the endzone, Wisconsin drove down the field for their first break of the game, and punched in a second after forcing a tough high-release from Trent Dillon at the end of a stall count to tie up the score at 7-7. Now it was Pittsburgh’s turn to respond to pressure, as they came out on the line needing to hold to take half. “It reminded me of our 2013 semifinal against Oregon, where we could have gone into half 8-5 but gave up two breaks to tie it up” said Pitt assistant coach Dave Hogan. “In 2013 we responded by going with our bread and butter, Alex (Thorne) hucking it to Tyler (Degirolamo). We did the same thing today.” That bread and butter was Pat Earles hucking to Max Thorne, which worked out for Pitt just as it did three years ago, with Thorne beating Aaron Speiss in a footrace to reel in the goal that gave Pitt an 8-7 lead. When the second half kicked off, the rain had all but stopped, and Wisconsin took advantage by breaking again to tie the game 8-8. With the game back even, the offenses on both teams started to adjust and each ran off a string of holds. Wisconsin responded to Pitt’s force out and poaches by sweeping a cutter from the sideline across the middle, which provided just enough space for their cutters to work the disc downfield. Pittsburgh used Wisconsin’s aggressive defense against them, getting them to bite on force side fakes and working the disc on around breaks. The big moment happened at 11-11, when Wisconsin’s center handler Avery Johnson threw a turn on the first throw, not seeing Pitt’s Kevin Tang poaching in the handler lane as the soft cap horn blew. Pittsburgh worked the disc to senior Carl Morgenstern who sent a hammer to a waiting Tang in the back of the endzone that gave Pitt their first break of the second half and put them in the driver’s seat with a 12-10 lead, game to 14. The teams traded holds to 13-12 but not without drama, as Pitt just missed on a huck that could have given them another break and Max Thorne leaped stupifingly high to pluck a Trent Dillon huck out of the air over Sterling Knoche. Pitt received, just needing to hold to win the game and advance to semifinals. They fastidiously worked the disc downfield into the teeth of Wisconsin’s man defense, with every throw squeezed into tight windows just out of the range of the hungry Hodag defenders. Wisconsin finally got the break they needed near Pitt’s attacking brick mark, when Andrew Lehmberg turfed an I/O flick, giving the Hodags a chance to score and force double game point. Wisconsin took a timeout to set their offense, and while the teams huddled the skies opened up and unleashed a deluge of rain, just in time for the game’s dramatic final moments. With the sidelines and packed stands going crazy amidst the downpour, chaos ensued on the field. Aaron Speiss dropped Wisconsin’s first throw, but promptly got the disc back after Pitt’s Jack Slevin underthrew an O/I flick to the endzone. Wisconsin turned again on a swing near the goal line, but a Sterling Knoche layout block regained possession for the Hodags, only for Christian Pitts to knock a low huck out of the sky and earn the disc back to En Sabah Nur. With both teams scrambling to get in position after the flurry of turnovers, Trent Dillon took advantage of the chaos and launched a skyscraping break backhand into the endzone towards Kyle Heartley and his defender. Time seemed to stop for a moment as the fate of the game and Wisconsin’s season hung in the air along with the disc. Pitt will face another tough North Central opponent in Minnesota this evening, and they’ll need to get back to the level they played at this morning if they want to continue their quest for a title on Monday. If they can continue to get production out of their D-line role players, and the big four of Dillon, Thorne, Earles and Pitts play to their potential, then Pittsburgh could very well make it to Monday, and possibly add a third National Championship to their trophy case. In an unforgettable semifinals victory over Pittsburgh, Minnesota underscored a simple fact: they were the deepest team in the country this season. While Minnesota (#4) had started the tournament as a narrow favorite over Pitt (#5), a rash of injuries that would have devastated lesser teams made Grey Duck anything but. This should have been a very different team than the one that started elimination play. In prequarters, they lost freshman sensation Cole Wallin and D-line star Sam Bumsted in an upset of the top seeded Massachusetts. Minnesota’s Callahan nominee Ryan Osgar, whose six assists led them to a win against Colorado a round earlier, was ruled out with a lingering knee injury. Then in the middle of this semifinals match against a Pittsburgh team trying to become the first modern dynasty, Tristan Van de Moortele (who already had three goals) pulled up lame with an apparent hamstring problem. If you look at the situation from a Moneyball perspective, when Van De Moortele went down, Minnesota was replacing guys who accounted for a staggering 26 goals and 43 assists thus far at Nationals. Perhaps most enigmatic is that each of those players were available for a Friday pool play meeting with Pitt ” a game in which Minnesota blew a 13-11 lead. But it’s hard to beat a team twice. Through intermittent downpours and with a well-lubricated crowd behind them, the boys from Minneapolis put on a gutsy performance that would become the game of the tournament. The contest started the way it was supposed to for a squad missing as much firepower as Minnesota. Pitt capitalized on the first Grey Duck turnover of the game when rookie Mike Ing made a heads up play on a huck intended for a teammate to go up 3-1. At this point if you’re Vegas, Minnesota objectively had no chance. They are just too snakebitten with injury. Pitt is too stacked. If they were going to win this game they were going to have to hold on every O point and at the very end…pray, maybe. The next offensive possession wasn’t perfect, though Duck would hold. Then, in an incredible sequence, Minnesota would rattle off three breaks. Trent Dillon missed on two deep flick hucks that carried just a little too far for their targets, and Soham Shah dealt a lefty backhand to Connor Anderson at the front cone for 3-3. Max Thorne muffed an inside throw and Wyatt Mekler hit Alex Jirele with a touch flick for Jirele’s second goal of the tournament. Anderson poached his man for a layout block on a Pitt in cut then Mekler found Van De Moortele for Grey Duck’s fourth straight point. Minnesota now led 5-3. This is where you really start to notice the matchup differences from the first meeting between these two teams on Friday. With Cole Wallin out, Van De Moortele and freshman Zach Trosvig took Thorne. Connor Anderson was now covering Dillon, who won the Callahan Award earlier in the day, in place of Sam Bumsted (who is five inches taller than Anderson). So many unfamiliar faces were coming into the game on defense you had to have your program folded to Minnesota’s roster at all times. And the madness of it is that they were all playing well. Rain was coming down in sheets just before halftime. Pitt trailed 7-5 and desperately had to hold but Ben Jagt got a sneaky block on what seemed like one of three dozen around backhand breaks from Dillon near the Minnesota goal line and Grey Duck called timeout to give themselves the best chance to break. After some high stall throws, Jagt found Tony Poletto at the cone. Minnesota went ahead three breaks and held to start the second half for their biggest lead of the game at 9-5. Minnesota was invigorated but all parties at WRAL Soccer Park seemed to know that some kind of Pitt comeback was inevitable. It just wouldn’t have made sense for a team with Dillon, Thorne, and Pat Earles to close the book on their college careers without some pushback. The Pitt stars got assists on the three of the next four goals to rally back and knot the game at nine. As if there weren’t enough grounded ducks, at 9-6 Minnesota’s Tristan Van De Moortele, who had been critical for the offense in the absence of Ryan Osgar, went down with a hamstring injury. Pittsburgh’s D-line had started to generate some consistent pressure running force flick and funneling cuts to the forehand side. Minnesota’s stack drifted too deep from time to time. Trapped Grey Duck players had to put up some high stall shots on a few occasions. If you’re going to do that, it helps to have Ben Jagt. The atmosphere in the stadium was like a home game for Minnesota. The lightning delay in the earlier semifinal gave soaking wet fans some extra time to get crazy. Through the hit parade of Jock Jams coming from Auburn’s Hank Womble’s trombone, the crowd rallied around Jagt and his Grey Duck team in a way seldom seen. Jagt’s unique combination of size, speed, and pun-versatile last name propelled him to cult hero status. Twitter was ablaze with Jagt-related memes. His big plays (like the five goals and pair of assists he registered) were almost always celebrated by those in attendance with a Jagt-centric rendition of Shots by LMFAO ft. Lil Jon. Between pulls, the masses joined the Minnesota Quack!… Quack!… chant. While there was a strong Pittsburgh contingent (southwestern Pennsylvania is only about seven hours from Raleigh), Joe Ultimate Fan was pulling for Minnesota. This new fan base also rained poignant heckles down upon Pitt, like “Leeeeeeeeeee-hiiiiiiiiiiiiiiigh!” a reference to the D-III sized school that upset Pittsburgh at Ohio Valley regionals. Pedigree, injuries, weather… none of it mattered anymore. Minnesota had to find a way to hang on. Excitement would not wane down the stretch. Duck’s offense settled back in and churned out some clutch holds. After a second Trosvig block on a huck to Thorne, Minnesota broke to pull ahead 12-10. Again Minnesota would have a chance to convert on defense with a 40 yard try to the end zone before Pitt’s Kyle Hartley would make up the ground for a trailing edge, highlight reel stop. Pittsburgh held and broke back. Minnesota found themselves in trouble with a shaky O point that ended in a Mekler dime hammer to Anderson late in the count. Pitt responded in kind with an all too familiar Earles huck to Dillon. 13-13. Double game point. Minnesota patiently worked the disc up the force to the goal line and sent it around to the break side. Mekler found Shah in the shallow break space with a low flick. Shah went down and tackled the catch with two hands to be absolutely certain, and there it was. Ballgame. Next man up. It had been said in conversations with players and by Boyd repeatedly when the injuries started and, let’s be honest, sounds like nothing more than coach speak. Yet, somehow this mantra was spoken into reality as top players were dropping like flies. About the only thing going right for Minnesota was that they practice late at night (due to the weather delays, the game ended around 12:30 AM) and they were unburdened of expectation. Who doesn’t love being the ‘dog? Pittsburgh had expectations of their own. Though it didn’t work out the way the senior-heavy team had planned, they lost to the eventual champion and staged a late comeback using the full complement of their roster -” something they may not have been able to do a year ago. 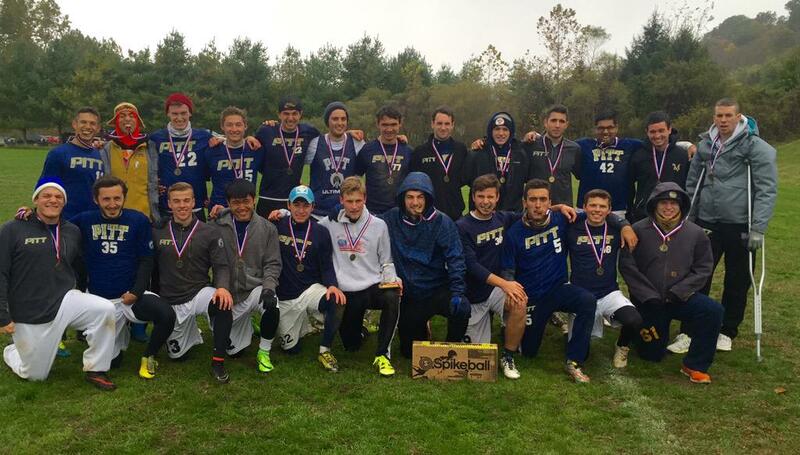 Pittsburgh-B at the Fall Championships.